This will be her first grandchild so I was honored to be given this opportunity, and also VERY nervous! 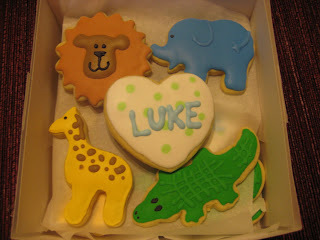 It was my first official sugar cookie order! I jumped right in with the ideas and researched online. 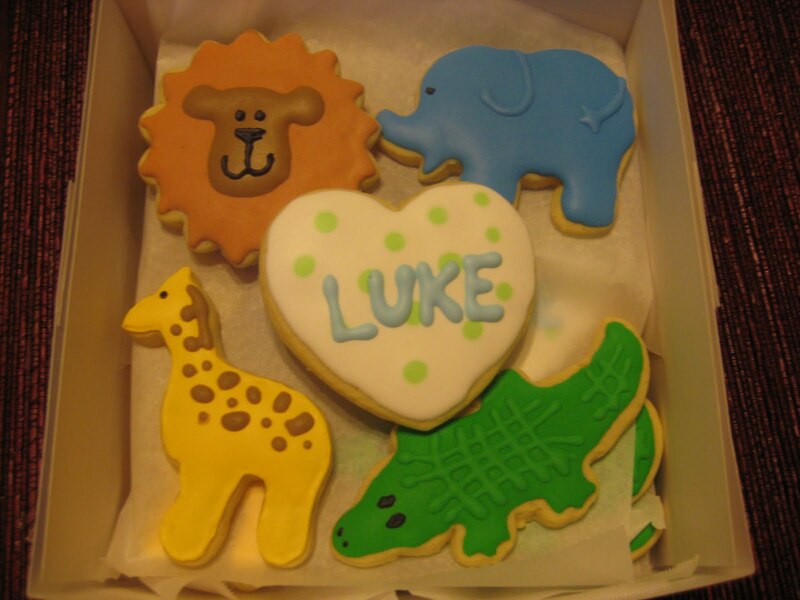 I decided I wanted to do elephants, alligators, giraffes, and lions. I also wanted to do something that had her grandsons name on it. Here is what they ended up looking like! Oh, and in case you're wondering...I used my beloved squeeze bottles for all of the decorating except for the details on the alligator and elephant. For their textures I used a piping bag and a #1 tip. OH! By the way, I found the BEST website online called Karen's Cookies. She sells a bazillion cookie cutters and....wait for it....SQUEEZE BOTTLES! These are not your ordinary squeeze bottles either, these babies come with couplers and allow you to switch out the tip so you can use all of your favorites! I am SO getting one. Okay, that's enough of my babbling for now...happy baking everyone!